This page includes lighthouses of France's southeastern coast, the Côte d'Azur, often called the French Riviera in English. The Riviera includes two départements of the French Republic, Alpes-Maritimes and Var. Alpes-Maritimes is famous for its resorts; it includes many well-known vacation destinations including Nice, Antibes, and Cannes. 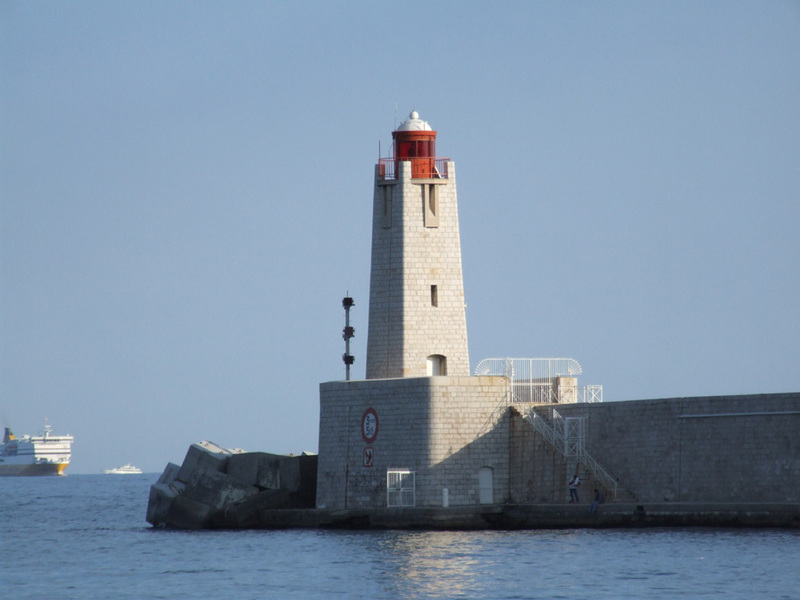 The lighthouses of Monaco, an independent nation embedded in the Riviera, are on a separate page. Alpes-Maritimes was formerly included in the County of Nice, which was part of the Kingdom of Sardinia until 1860. However, no lighthouses survive from the period of Sardinian rule. The French word for a lighthouse, phare, is often reserved for the larger coastal lighthouses; a smaller light or harbor light is called a feu (literally "fire," but here meaning "light"). The front light of a range (alignement) is the feu antérieur and the rear light is the feu postérieur. 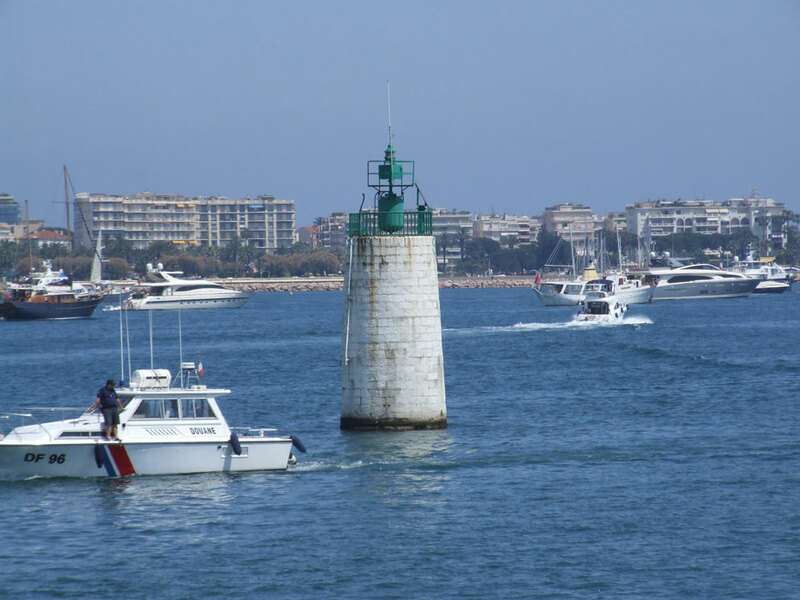 Aids to navigation in France are maintained by the Bureau des Phares et Balises, an agency of the Direction des Affaires Maritimes (Directorate of Maritime Affairs). The Directorate has four regional offices (called Directions Interrégionale de la Mer, or DIRM) at Le Havre, Nantes, Bordeaux, and Marseille. 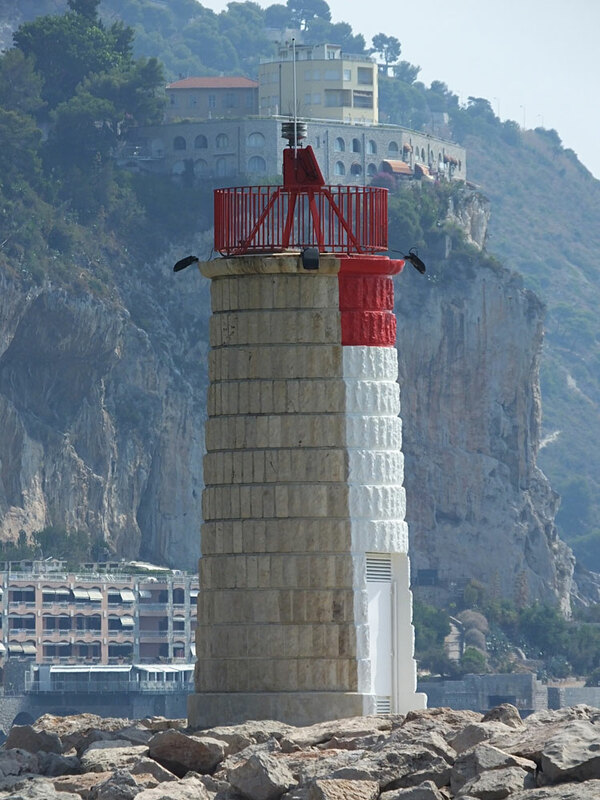 Mediterranean lighthouses fall under the Marseille office, DIRM Méditerranée. ARLHS numbers are from the ARLHS World List of Lights. FR numbers, where available, are the French light list numbers. Admiralty numbers are from volume E of the Admiralty List of Lights & Fog Signals. U.S. NGA List numbers are from Publication 113. A large, well known site maintained by Alain Guyomard and Robert Carceller. Another large and well known site, this one by Jean-Christophe Fichou, rich in historical information. 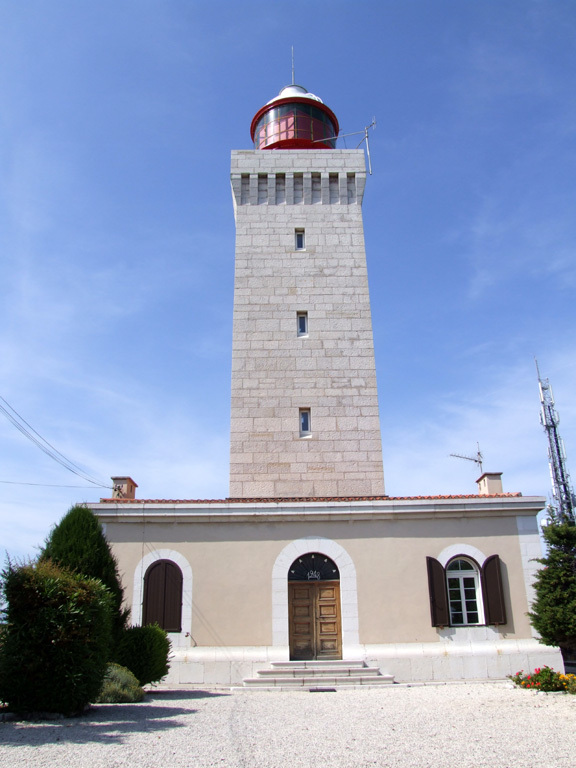 Historical data on more than 180 French lighthouses, with photos of most of them. This comprehensive site has good photos and information about the major lighthouses. Photos by various photographers posted by Alexander Trabas. For this area, many of the photos are by Arno Siering or by Heidi and Friedrich Klatt. The French national lighthouse preservation organization. Historic photos and postcard images posted by Klaus Huelse. Navigation chart information for southern France. 1966. Active; focal plane 11 m (36 ft); two red flashes every 6 s. 10 m (33 ft) round stone tower. The seaward side of the tower is painted white with a red horizontal band at the top; the landward side is unpainted. Trabas has a fine photo by Capt. Peter Mosselberger, Chris Continanza has a closeup photo, and Google has a street view and a satellite view. The harbor of Garavan is only 700 m (0.4 mi) west of the Italian border. Located at the end of the Garavan breakwater. Site and tower closed, but there is an excellent view from the shore. ARLHS FRA-356; Admiralty E0849; NGA 7272. 1890. Active; focal plane 16 m (52 ft); four very quick red flashes every 3 s. Approx. 10 m (33 ft) round cylindrical cast iron tourelle with lantern and gallery, mounted on a large stone pier. Tower painted white, lantern and gallery red. Bruno Collinet's photo is at right, Guyomard and Carceller also have a photo, Trabas has an excellent photo by Siering, a fine closeup is available, and Google has a street view and a satellite view. Small cast iron towers of this type, called tourelles, were manufactured and installed in large numbers during the late 1800s and very early 1900s. 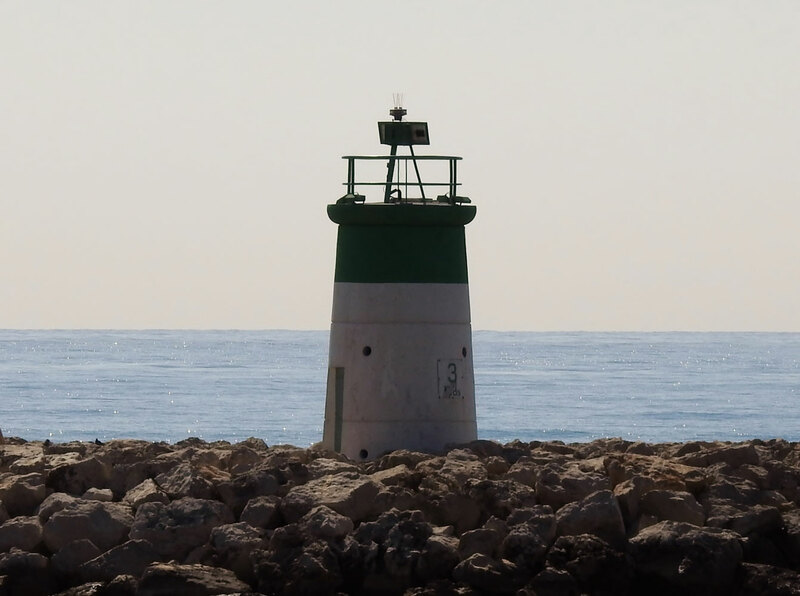 Few survive, especially on the Mediterranean coast where German troops destroyed nearly all harbor lights in 1944 to prevent their use by Allied forces. As a result, this little lighthouse is a rare and valuable monument. 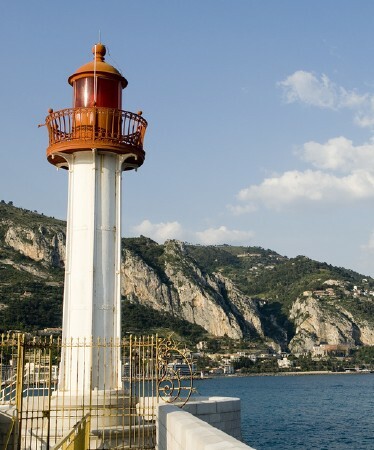 Located on the end of the breakwater mole (the Quai Napoléon III) on the south side of the harbor of Menton, about 2 km (1.2 mi) west of the Italian border. Site open, tower closed. ARLHS FRA-357; Admiralty E0848; NGA 7268. 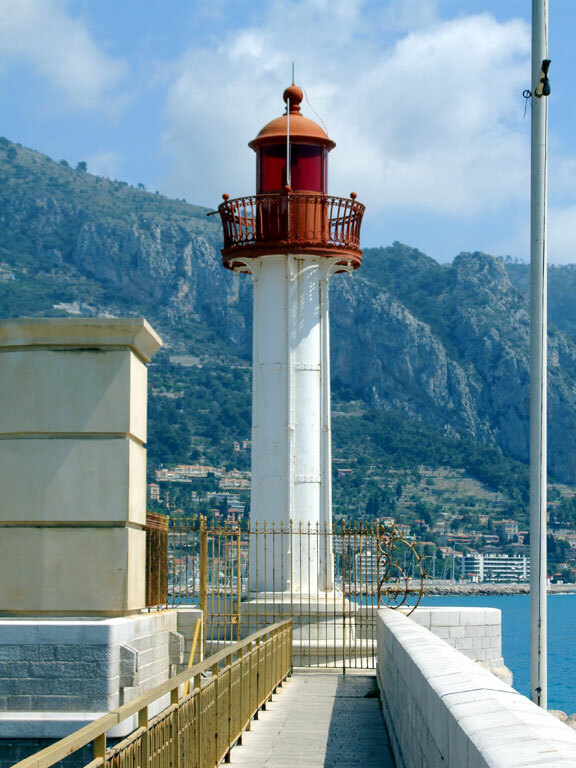 Note: There is a separate page for the lighthouses of the Principality of Monaco, located between Menton and Cap Ferrat. Date unknown (station established 1867). Active; focal plane 9 m (30 ft); four white flashes every 12 s. 9 m (30 ft) round concrete or masonry tower. Lighthouse painted white with a red lantern structure supporting the light. Trabas has a good photo by the Klatts, another photo is available, and Google has a sea view and a satellite view. Located at the end of the breakwater of Saint-Jean-Cap-Ferrat, on the east side of the peninsula of the cape about 2.5 km (1.5 mi) north of the Cap Ferrat lighthouse. Accessible by walking the breakwater. Site open, tower closed. ARLHS FRA-838; Admiralty E0833; NGA 7220. 1952 (station established 1838). Active; focal plane 69 m (226 ft); white flash every 3 s. 32 m (105 ft) octagonal stone tower with lantern and gallery, attached to a 2-story masonry keeper's house. The tower is unpainted white stone; the lantern is green with a white roof. A photo is at the top of this page, Trabas has a closeup photo by Siering, Eric Farber has a good photo, Wikimedia has several photos, and Google has a satellite view and a walkway view from below the lighthouse. 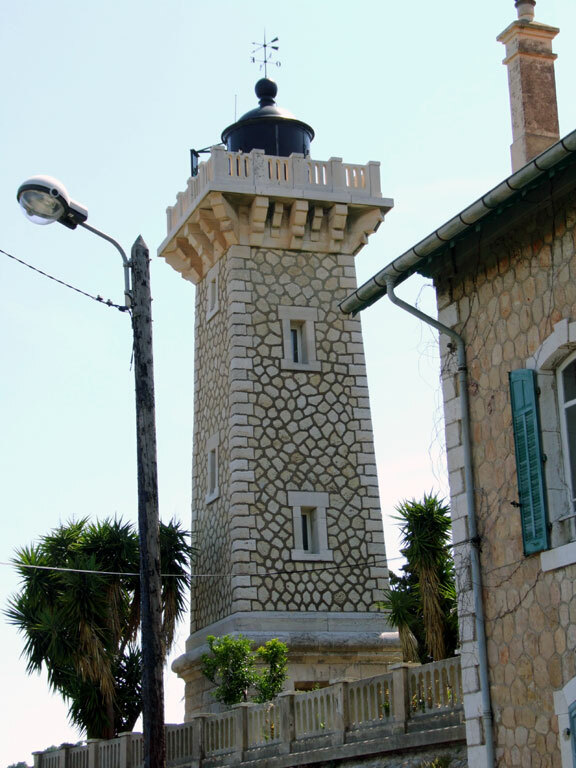 This is one of the oldest light stations of the Côte d'Azur, along with Cap Camarat and Antibes. It was established by the Kingdom of Sardinia, which controlled Nice until 1860. Huelse has a historic postcard view of the original lighthouse, which was blown up by German troops in 1944. Cap Ferrat is a very prominent cape projecting into the Mediterranean between Nice and Monaco. 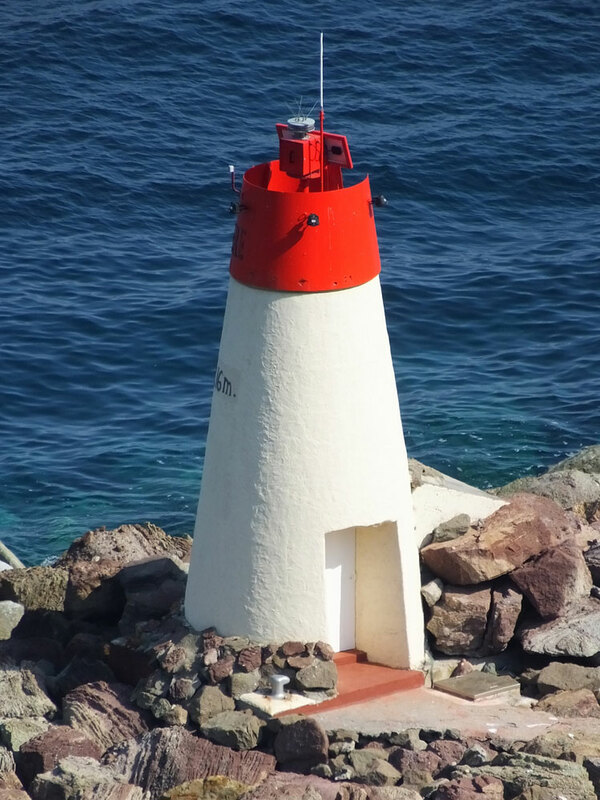 Located above the point of the cape, on the Avenue du Phare in Villefranche-sur-Mer. Site open, tower closed. ARLHS FRA-099; FR-1508; Admiralty E0828; NGA 7216. Date unknown (station established 1867). Active; focal plane 8 m (26 ft); quick-flashing light, white or red depending on direction. 9 m (30 ft) round tower, with a red cylindrical lantern structure centered on the roof of a square 1-story white masonry equipment building. Trabas has a photo by the Klatts, Guyomard and Carceller have a photo, and Google has a street view, a sea view, and a satellite view. Located at the end of the main breakwater of Villefranche-sur-Mer. Accessible by walking the pier. Site open, tower closed. ARLHS FRA-534; Admiralty E0830; NGA 7208. 1880 (station established 1855). Inactive since 1909. Approx. 11 m (36 ft) white round masonry tower; lantern removed. Google has a street view, a sea view and a satellite view. The harbor of Nice is protected by a breakwater that extends to the east. New lighthouses were built on the breakwater each time it was extended: in 1880, 1909, and 1928. 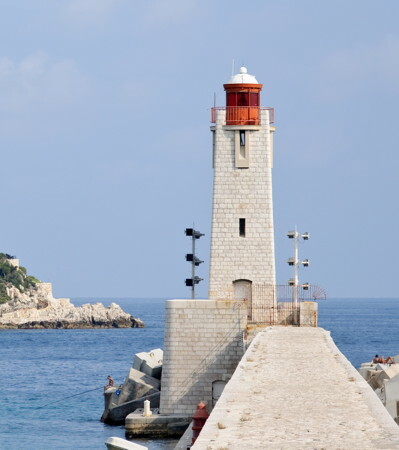 The 1909 lighthouse was cast iron, so the "ancien feu de Nice" in Guyomard and Carceller's photo must be the 1880 tower. Fichou outlines the history of the station. Located at the end of the Traverse du Commerce, the cruise ship quay of Nice. Site open, tower closed. Date unknown (probably around 1950). Active; focal plane 21 m (69 ft); red flash every 5 s. 22 m (72 ft) square masonry tower with lantern and gallery, mounted on a large square stone base. Lighthouse is white, lantern red with a white roof. A photo is at right, Trabas has an excellent closeup photo by Siering, Guyomard and Carceller have additional closeup photos, Wikimedia has several photos, Faradj Saadana has a street view from the pier, and Google has a sea view and a satellite view. The 1928 lighthouse, the fourth on the Nice breakwater, was heavily damaged during World War II; it was replaced by a wooden tower in 1945 and then by this lighthouse. Located at the end of the Nice breakwater; accessible by walking the pier. Site open, tower closed. ARLHS FRA-370; FR-1500; Admiralty E0822; NGA 7184. Date unknown. Active; focal plane 10 m (33 ft); three green flashes every 12 s. 8 m (26 ft) round concrete tower, painted white with a green band at the top. Trabas has Siering's photo and Google has a sea view, a street view and a satellite view. 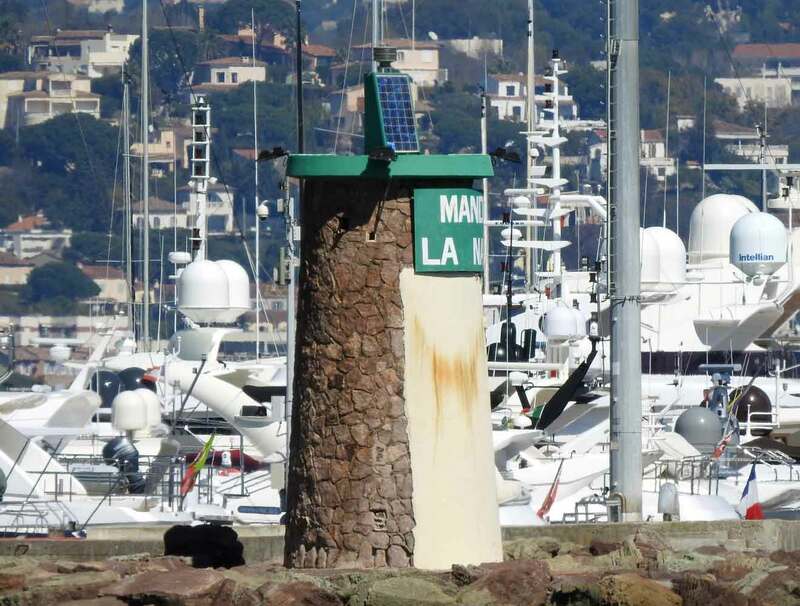 Located at the end of the east breakwater at the Marina Saint-Laurent-du-Var, just west of the Nice airport. This breakwater does not appear to be walkable. Site open, tower closed. ARLHS FRA-618; Admiralty E0821; NGA 7168. Date unknown. Active; focal plane 13 m (43 ft); two green flashes every 6 s. 10 m (33 ft) round tower, painted white with a green band at the top. Trabas has a photo of the two breakwater lighthouses, and Google has a street view, a sea view, and a satellite view. 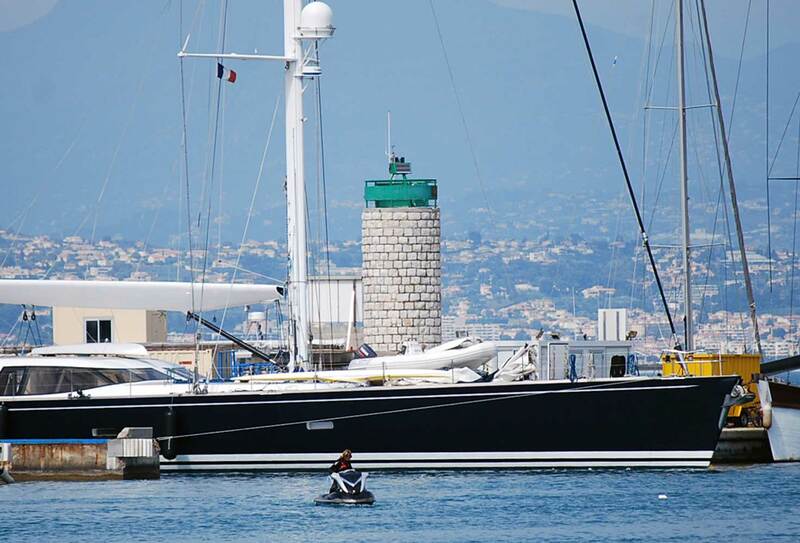 Located at the end of the east breakwater at the Marina Baie des Anges, north of Antibes. This breakwater does not appear to be walkable. Site open, tower closed. ARLHS FRA-543; Admiralty E0818.7; NGA 7164. Date unknown. Active; focal plane 6 m (20 ft); two red flashes every 6 s. 5 m (16 ft) round tower, painted white with a red band at the top. Trabas has a photo and Google has a street view, a sea view, and a satellite view. 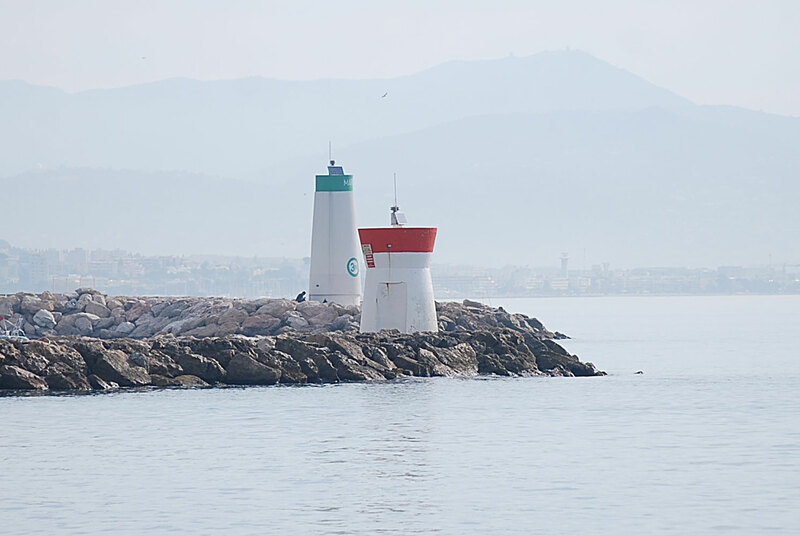 Located at the end of the south (really west) breakwater at the Marina Baie des Anges, north of Antibes. This breakwater does not appear to be walkable. Site open, tower closed. ARLHS FRA-544; Admiralty E0818.6; NGA 7160. Date unknown. Active; focal plane 10 m (33 ft); green light, 2 s on, 2 s off. 7 m (23 ft) round masonry tower. Tower unpainted, but the light structure at the top is green. Trabas has a photo and Google has a sea view and a satellite view. This light is located at the end of a breakwater mole on the west side of harbor, below the the 16th century Fort Carré. Accessible by walking the mole. Site open, tower closed. ARLHS FRA-556; Admiralty E0819.6; NGA 7144. 1834. Inactive. 12 m (39 ft) round masonry tower with gallery; the lantern has been removed and the light was shown from a tripod. The lighthouse is floodlit at night. Guyomard and Carceller have a closeup photo, Huelse has a postcard view, Chris Richard has a closeup street view, and Google has a sea view, and a satellite view. The lighthouse was active at the time of a 2005 nighttime photo; it was deactivated because expansion of the harbor made it redundant. Located on the east side of the entrance to the old inner harbor of Antibes, off the Quai Henri Rambaud. Accessible by walking the mole. Site open, tower closed. ARLHS FRA-596; ex-Admiralty E0819.5; ex-NGA 7152. Date unknown. Active; focal plane 15 m (49 ft); four flashes every 15 s, white or red depending on direction. 10 m (33 ft) round cylindrical concrete tower, painted white with red trim. 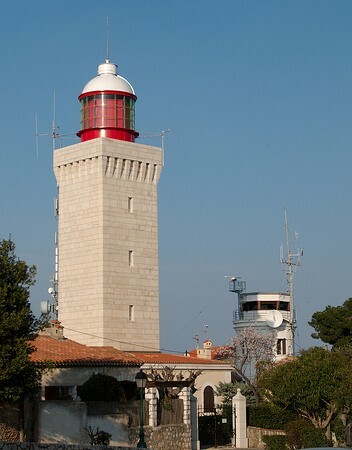 This is the light shown at the top of Guyomard and Carceller's Antibes page; Trabas has a photo, a closeup photo is available, and Google has a sea view and a satellite view. This light replaced the historic Cinq Cent Francs lighthouse. 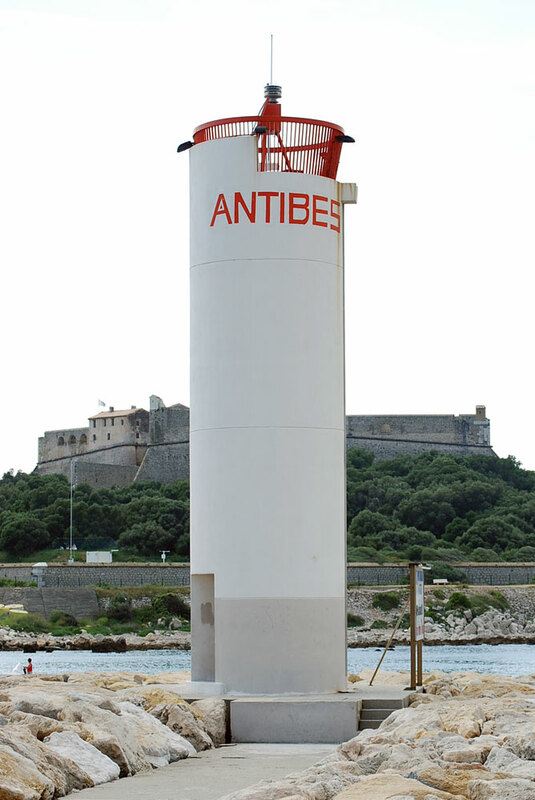 Located at the end of the main breakwater at Antibes. Accessible by walking the mole. Site open, tower closed. ARLHS FRA-555; Admiralty E0819; NGA 7140. 1948 (station established 1837). Active; focal plane 104 m (341 ft); two white flashes every 10 s. 29 m (95 ft) square stone tower centered on the roof of a 1-story stone keeper's house. Lighthouse is white, lantern painted red with a white dome. A photo is at right, Trabas has Siering's closeup photo, Phareland.com has numerous photos, Wikimedia has several photos, and Google has a closeup street view and a good satellite view. 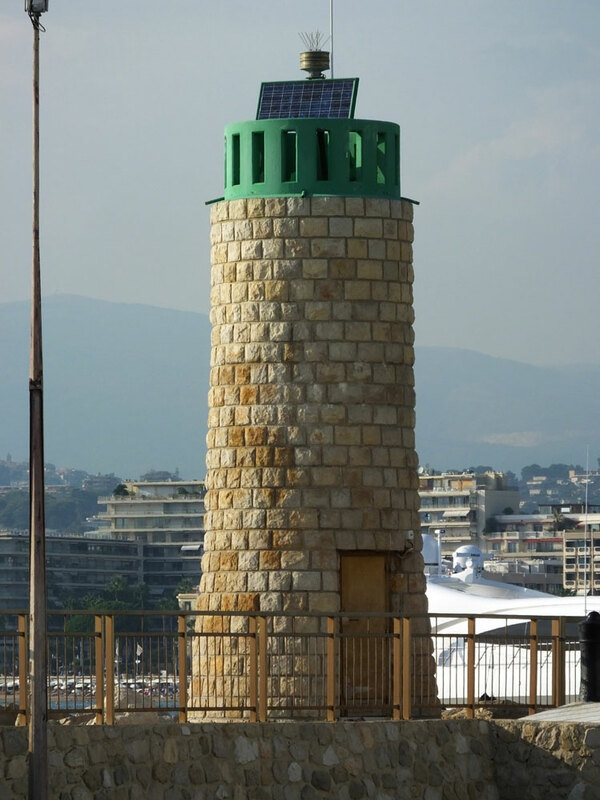 This is a landfall light for Antibes, Cannes, and the Côte d'Azur; it is one of the most powerful lights of the Mediterranean with a range of 31 nautical miles (57.5 km, 35.5 mi). Huelse has a historic postcard view of the original lighthouse, a 24 m (79 ft) round cylindrical masonry tower blown up by German troops in 1944. 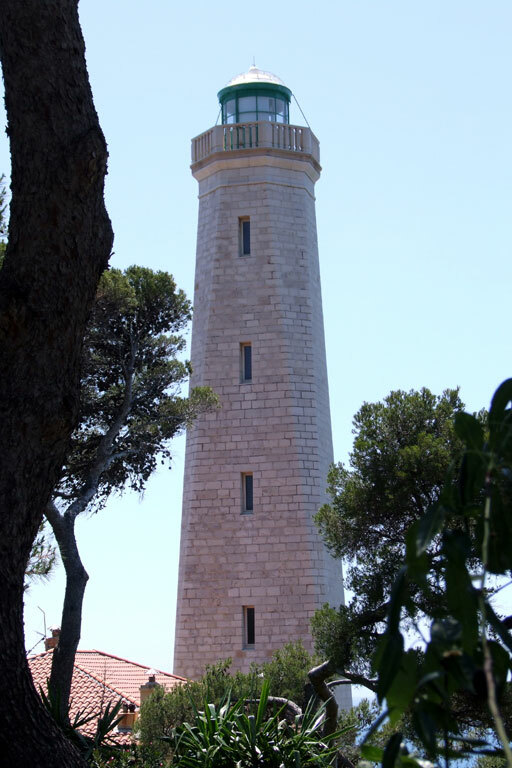 The lighthouse is surrounded by the Bois de la Garoupe, a 9 ha (22 acre) forest preserve managed by the city of Antibes. Located on the Route du Phare in Antibes, overlooking the Baie des Anges. Site open, tower closed. ARLHS FRA-111; FR-1498; Admiralty E0818; NGA 7136. 1910 (station established 1870). Active; focal plane 18 m (59 ft); white, red or green light depending on direction, occulting three times every 12 s. 15 m (49 ft) round slender cylindrical masonry tower with lantern and gallery. Tower painted white, lantern black. Lise Schau has a closeup photo, Trabas has a photo by Egidio Ferrighi, and Google has a satellite view. Huelse has a historic postcard view of the original lighthouse. 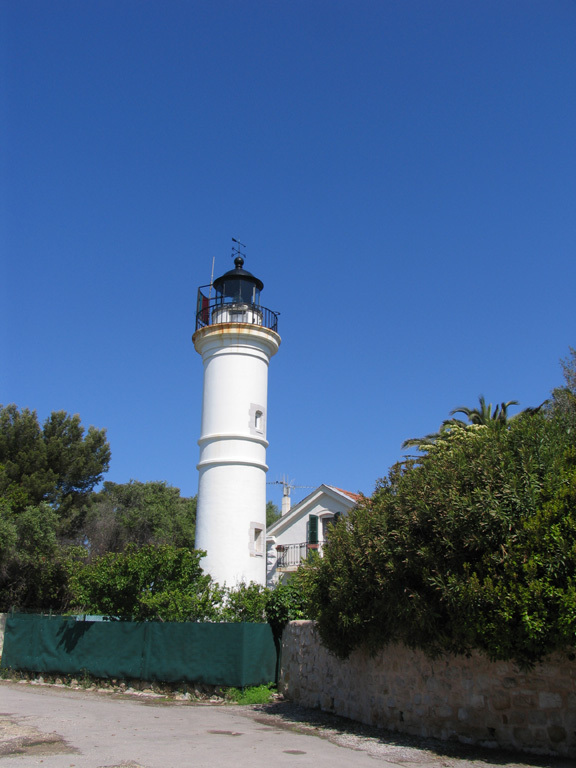 This lighthouse is located at the southwestern point of the Cap d'Antibes peninsula, marking the east side of the entrance to Golfe Juan. The point is on a small island (îlette) connected to the mainland by a narrow isthmus. 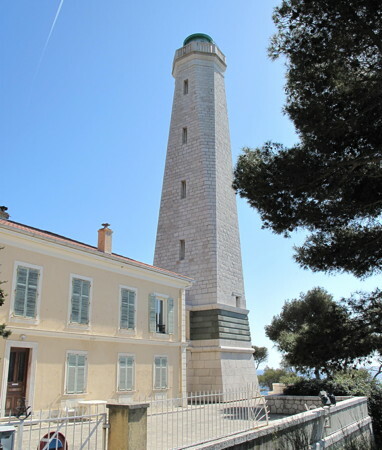 According to Guyomard and Carceller, this is in a restricted residential area (Buehler calls it the baie des millionaires), so there is no public access to the lighthouse. Site and tower closed. ARLHS FRA-120; Admiralty E0814; NGA 7132. Date unknown. Active; focal plane 10 m (33 ft); three very quick green flashes every 2 s. 8 m (28 ft) round cylindrical white tower. Trabas has Siering's distant view and Google has a sea view and a satellite view. Located at the end of the breakwater of Port-Gallice, on the east side of Golfe-Juan. Accessible by walking the pier. Site open, tower closed. ARLHS FRA-834; Admiralty E0811; NGA 7124. Date unknown. Active; focal plane 10 m (33 ft); two green flashes every 6 s. 6 m (20 ft) round tower with gallery. Tower painted white with a green horizontal band at the top. Romeo Reidl has a 2007 photo, Trabas has Capt. Peter Mosselberger's photo, and Google has a sea view and a satellite view. 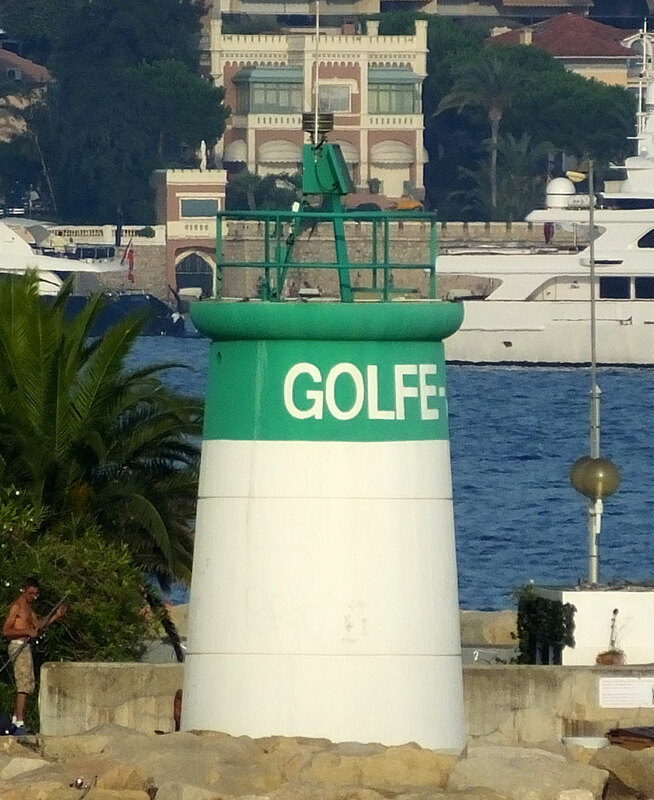 Located at the end of the breakwater mole of Golfe-Juan. Accessible by walking the mole. Site open, tower closed. ARLHS FRA-561; Admiralty E0810.4; NGA 7122. 1927 (station established 1900). Active; focal plane 167 m (548 ft); white, red or green light depending on direction, occulting twice every 6 s. 19 m (62 ft) square stone tower with lantern and gallery. 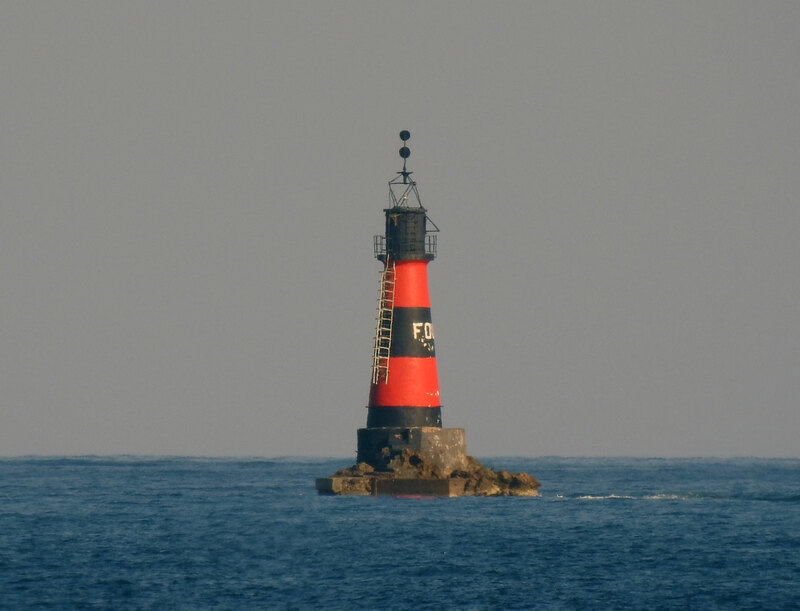 The lighthouse is unpainted white stone; lantern painted black. Trabas has a closeup photo by Siering, Andreas Köhler has a photo, several additional photos are available, Huelse has a historic postcard view, and Google has a street view and a satellite view. This is France's highest lighthouse. There are several photos of the original lighthouse, a round stone tower; it was built on sandy soil near the beach and had to be replaced when it began to lean dangerously. Located on the Boulevard des Horizons high on the hillside in Vallauris, overlooking the Golfe-Juan about 3 km (2 mi) east northeast of the Cannes waterfront. Site open, tower closed. ARLHS FRA-530; FR-1494; Admiralty E0808; NGA 7116. 1917. Active; focal plane 16 m (52 ft); two white flashes every 10 s. 17 m (56 ft) solid round stone tower with a "watchroom" structure and two galleries; the light is displayed from a tripod. Tower painted with red and black horizontal bands. Fabien Krawiec has a closeup photo, Trabas has a distant view by the Klatts, and Bing has a satellite view. A fourmi is an ant; sailors sometimes refer to small rocky skerries as ants. Located on a rock in the center of the entrance to Golfe Juan about 2.5 km (1.5 mi) south of the harbor. Accessible only by boat; there are distant views from shore everywhere in Golfe-Juan. Site and tower closed. ARLHS FRA-016; Admiralty E0806; NGA 7112. Date unknown. Active; focal plane 12 m (39 ft); six quick white flashes, followed by one long white flash, every 15 s. 12 m (39 ft) round concrete post light with gallery, mounted on a round pier. Upper 2/3 of the lighthouse painted yellow, base black. The tower also carries a topmark, two triangles on a short mast. A photo is at right and Google has a satellite view. The Îles de Lérins are a group of islands close offshore southeast of Cannes. Several of the islands are inhabited and accessible by ferry. Located on a dangerous rocky shoal off the Île St.-Honorat, southernmost of the islands. Accessible only by boat, but there should be a view from the Île St.-Honorat. Site open, tower closed. Admiralty E0805; NGA 7108. Date unknown. Active; focal plane 11 m (36 ft); green flash every 4 s. 10 m (33 ft) unpainted round stone tower topped by a green lantern structure. A good photo is available, Trabas has a photo by Capt. Peter Mosselberger, Carceller and Guyomard have a small photo, and Google has a sea view, a satellite view and a distant street view from the waterfront promenade. 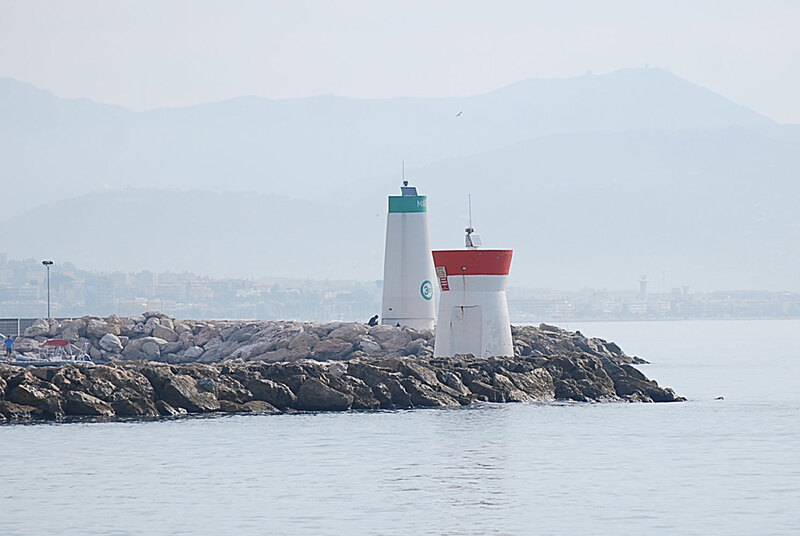 Located at the end of the east breakwater at Port Canto, a newer harbor on the east side of Cannes. Accessible by walking the breakwater. Site open, tower closed. ARLHS FRA-616; Admiralty E0803; NGA 7100. Date unknown. Active; focal plane 10 m (33 ft); two green flashes every 6 s. 14 m (46 ft) round stone tower, painted white; gallery rail and lighting apparatus painted green. Trabas has a good photo by Siering and Google has a sea view, a satellite view, and a distant street view. Located at the end of a submerged reef on the east side of the entrance to Cannes harbor. Accessible only by boat, but easy to see from shore. Site open, tower closed. ARLHS FRA-271; Admiralty E0801; NGA 7092. 1950 (station established 1854). Inactive. 10 m (33 ft) round masonry tower with lantern and gallery. Tower is unpainted white stone except for a yellow band under the gallery, lantern painted white. Alexis Maindrault has a good photo, a photo showing both old and new lighthouses is also available, Huelse has a historic postcard view, and Google has a sea view, a satellite view, and a distant street view. The original lighthouse was destroyed by German troops in August 1944; it was replaced by a copy. The lighthouse was deactivated when the mole on which it stands was extended by a riprap breakwater and a new light was built at its end. The yellow band was added in late 2007 or early 2008. Located at the end of the original mole at the old harbor of Cannes. Accessible by walking the mole. Site open, tower closed. ARLHS FRA-665. Date unknown. Active; focal plane 22 m (72 ft); three very quick red flashes every 2 s. 22 m (72 ft) hexagonal cylindrical concrete tower with lantern and gallery. Tower painted white with a red band under the lantern; lantern also painted red. A photo by Alberto Fernandez Fernandez is at right, Sam Cannon has another good photo, Trabas has a photo, Wikimedia has several photos, and Google has a sea view, a satellite view, and a distant street view. 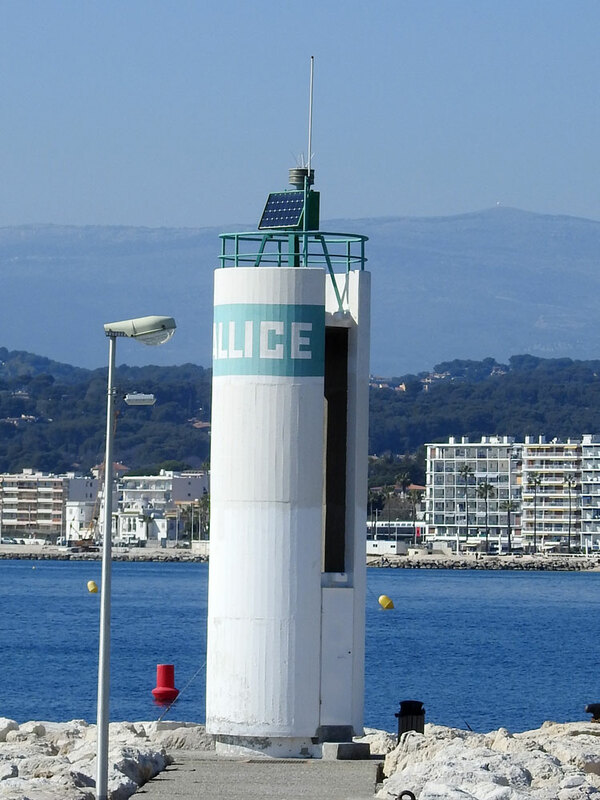 Located at the end of the breakwater at the old harbor of Cannes. This breakwater is not walkable but the lighthouse can be seen from nearby. Site and tower closed. ARLHS FRA-211; Admiralty E0800; NGA 7096. Date unknown. Active; focal plane 9 m (30 ft); three green flashes every 12 s. 7 m (23 ft) square tower, unpainted except for a white vertical stripe facing the sea and green trim at the top. Trabas has Siering's photo and Google has a sea view, a satellite view and a distant street view. Located at the end of the breakwater of the Marina de la Napoule on the north side of Théoule-sur-Mer. Accessible by walking the pier. Site open, tower closed. ARLHS FRA-348; Admiralty E0799; NGA 7084. Date unknown. Active; focal plane 9 m (30 ft); four green flashes every 15 s. 7 m (23 ft) round strongly conical white concrete tower. Trabas has a good photo by the Klatts and Google has a sea view, a street view and a satellite view. Located at the end of the breakwater of the Marina de la Rague on the north side of Théoule-sur-Mer. Accessible by walking the pier. Site open, tower closed. ARLHS FRA-578; Admiralty E0798.4; NGA 7080. Date unknown. Active; focal plane 8 m (26 ft); white or red light depending on direction, 2 s on, 2 s off. 6 m (20 ft) round unpainted stone tower with a small red lantern. Trabas has the Klatts' photo and Google has a sea view, a satellite view and a distant street view. 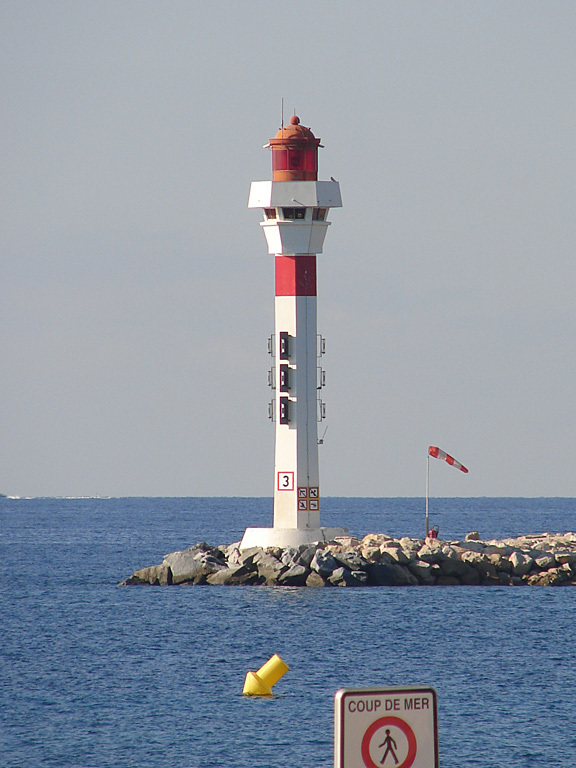 Located at the end of the east (main) breakwater in Théoule-sur-Mer. Accessible by walking the pier. Site open, tower closed. ARLHS FRA-626; Admiralty E0798; NGA 7076. 1961. Active; focal plane 9 m (30 ft); quick flashing red light. 7 m (23 ft) round conical concrete tower, painted white with a red band at the top. Trabas has the Capt. Peter Mosselberger's photo and Google has a sea view and satellite view. Located on the end of the breakwater at La Galère. Site open, tower closed. ARLHS FRA-598; Admiralty E0797; NGA 7072. Date unknown. Active; focal plane 12 m (39 ft); three flashes every 12 s, white or green depending on direction. 10 m (33 ft) platform supported by six piles rising from the corners of a hexagonal 1-story equipment shelter. Lighthouse painted white with a green band at the top. Trabas has the Klatts' photo and Google has a sea view, a street view and a satellite view. Located on the breakwater of the Marina la Figueirette in Miramar, on the south side of Théoule-sur-Mer. Accessible by walking the pier. Site open, tower closed. Admiralty E0796; NGA 7068. Date unknown (1890s?). Inactive. Approx. 7 m (23 ft) round cylindrical skeletal tower with lantern and gallery, painted white. Alain Meier's photo is at right, a 2008 photo is available, and Google has a satellite view. Amphion-les-Bains is on the central south shore of Lac Léman (Lake Geneva), opposite Morges, Switzerland. 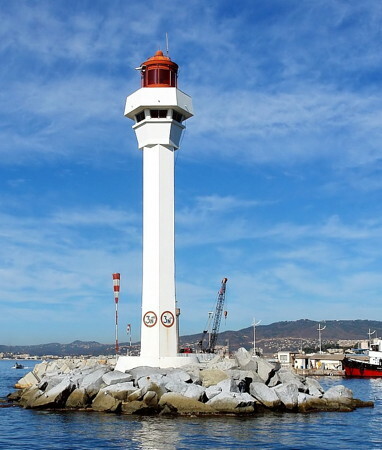 Located at a breakwater elbow at Amphion-les-Bains; accessible by walking the mole. Site open, tower closed. Date unknown (1890s?). Probably active; continuous (?) red light. Approx. 6 m (20 ft) cast iron post mounted on a round masonry base. Vyacheslav Eroshin has a photo, Jerome Favre has a street view, and Google has a satellite view. Located at the end of a pier at Évian-les-Bains, a popular resort town about 4 km (2.5 mi) east of Amphion-les-Bains. 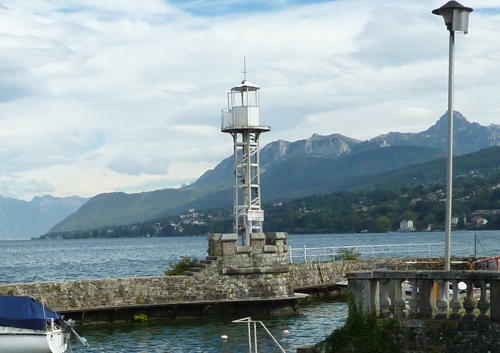 Located on the Quai du Baron de Blonay, marking the entrance to a small boat harbor. Site open, tower closed. Date unknown (around 1900?). Active? Approx. 10 m (33 ft) hexagonal hourglass-shaped skeletal tower with lantern and gallery. The lighthouse is gray metallic; lantern roof is dark red. No current photo available but Huelse has a historic postcard view and Google has a satellite view. The Jardins de l'Eau du Pré-Curieux is an environmental education center specializing in wetlands protection. Visitors reach the center by a solar-powered boat that departs from a quay on the west side of downtown Évian-les-Bains. Located on the center's quay. Site open, tower closed. Date unknown. Inactive? 4 m (13 ft) cylindrical cast iron tower on a 1-story octagonal cast iron equipment shelter. Lighthouse painted white. Pascal Baudet has a street view and Google has a satellite view. Information is needed on the history of this interesting little lighthouse. The Lac du Bourget, France's largest lake, is located in the Alps about halfway between Grenoble and Genève, Switzerland. The lake is 18 km (11 mi) long and has an altitude of 231.5 m (760 ft). The resort town of Aix-les-Bains is on the east side of the lake. Located at the end of the main pier at the Grand Port d'Aix-les-Bains. Accessible by walking the pier. Site open, tower closed. Posted April 7, 2006. Checked and revised February 18, 2019. Lighthouses: 32. Site copyright 2019 Russ Rowlett and the University of North Carolina at Chapel Hill.